This is my adaptation of a chiffon-pie recipe from the hard-to-find book [%bookLink code=0201632152 "A Southern Thanksgiving"]. Alongside apple and pecan pies, this lighter, crunchier version of pumpkin pie was a family Thanksgiving standard for years. Butter an 8- or 9-inch pie pan. Scrape the gingersnap mixture into the pan. Press the mixture firmly and evenly over the bottom and sides of the pan (a ½-cup measuring cup is good for this) to form a crumb crust. Bake for 8 to 10 minutes. Remove from the oven and let cool while you prepare and cool the filling. Make the filling: Place the egg yolks in a double-boiler insert and beat with a whisk until light. Slowly mix in the brown sugar and the milk. Stir in the pumpkin, spices, and vanilla. Put the insert over simmering water and cook for 10 minutes, stirring steadily. Remove from the heat. Pour the water, bourbon, brandy, or Grand Marnier into a small saucepan and sprinkle the gelatin powder over the surface. Let sit for 1 minute, then heat and stir slowly until the gelatin has dissolved and the liquid is translucent. Add the gelatin mixture to the pumpkin mixture, beating well to combine thoroughly. Chill in the refrigerator for 30 to 40 minutes, then beat again when cool. Place the egg whites in a bowl and beat with a whisk or electric mixer until they begin to form soft peaks. Slowly add the white sugar and continue to beat until the egg whites form stiff peaks. Fold the egg whites in stages into the pumpkin mixture, folding gently to incorporate after each ½ cup addition of egg whites. When the mixture is smoothly combined, scrape it into the cooled pie crust and chill, uncovered, for 30 minutes. If not serving after 30 minutes, cover with plastic wrap and return to the fridge. 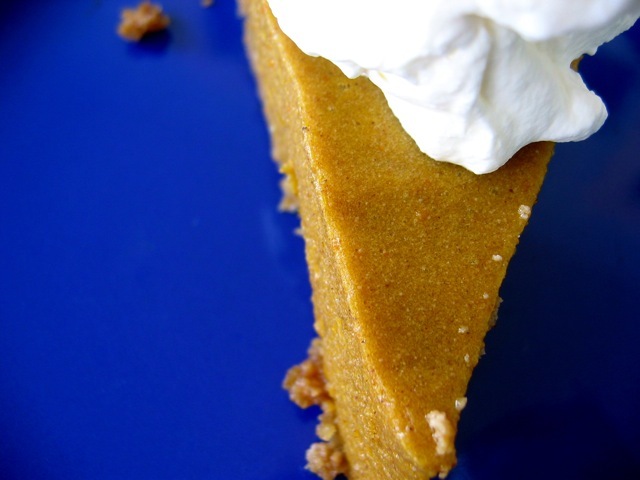 When ready to serve, whip the cream in a chilled bowl and dollop some on each slice of pie. You can make this pie a day ahead of time if you like. Simply keep it refrigerated, covered in plastic wrap or a sealed container, until you're ready to serve it. For a gluten-free version, replace the gingersnaps with gluten-free gingersnaps, such as those from Mi-Del. Read more about Thanksgiving menu planning in "Classic Thanksgiving."